This blog is in support for the immigrants who are from Afghanistan and Iraq who have been promised visas to come the the USA because they were people who were interpreters and translators for our American troops and the previous American Secretary of State and other important officials during our now last 15 years of war. These are people who risked their lives to help our troops and were absolutely essential to saving the lives of many of our US soldiers. 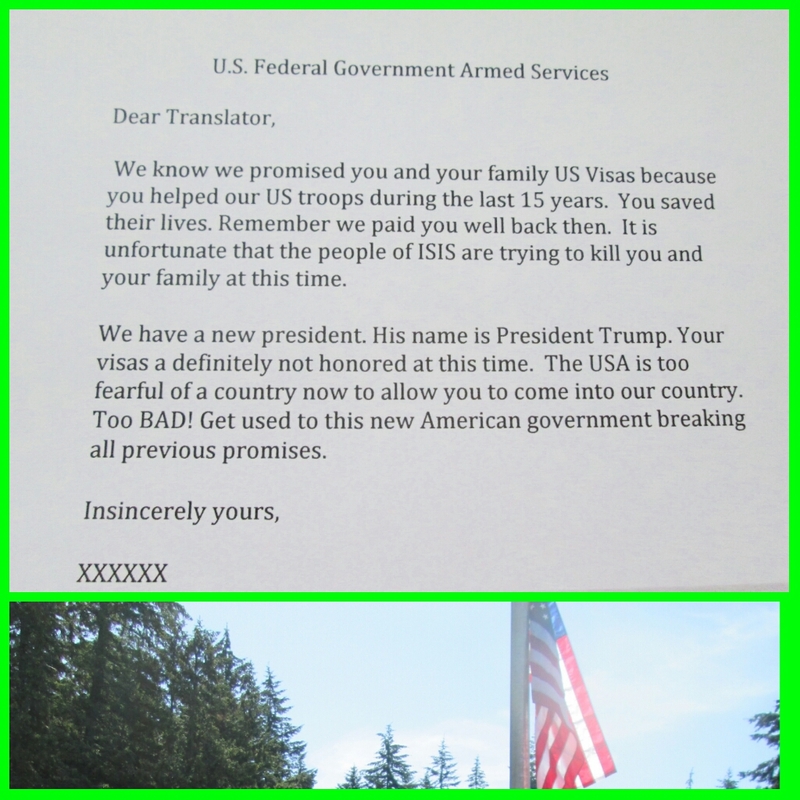 Because the US State Department and present Administration is so adverse to letting new immigrants in, some of these translators who helped OUR troops, are being murdered (including their families) while they are waiting on visas to the USA which were promised to them for their service to US war effort and our soldiers. Thurs. March 16, 2017, President Trump asked for a large increase of the federal budget for the US military. Without keeping our word to the people who have already helped American Soldiers in far reaches of the world, this president is showing the world that we are a nation which CANNOT be TRUSTED. Therefore, the president is putting the future US soldiers and military he wants to expand in great danger because of ignoring the promises the USA already made to people who helped our military and risked their lives for us in the past. Throwing money at the problem is NOT enough. And one of his claims is to protect our US soldiers. OH REALLY? Those are just vacant words and false promises. Who will stand with us in Iraq, Afghanistan and other countries to translate for our troops in the future as we try to defeat ISIS? One thing many Americans do NOT understand is that the world looks at us. We may not know about their culture or people, but they know a lot about ours. We are the big dudes on this planet, but we can NOT do the job without the people from the regions where we want to defeat ISIS. The only thing that is even making it possible to even allow a few more translators to get the immigrant visas they deserve to get into the USA, is that the President’s ban of immigrants is being fought in courts in the states of Hawaii, Washington, California, New York and Oregon. Still more than 10,000 of these interpreters who helped our county may be left out in the cold and not get the visas they deserve, and then more of them may be murdered by ISIS. How can the country that I love be so callous about people who helped US and saved our soldiers? This will certainly backfire, and we will lose more of our own US soldiers because of the choices of an ill-informed president who made a very destructive choice about Afghan and Iraqi people who helped us in the past. I hope the present Secretary of Defense Mattis will be able to get President Trump to see the fallacy in this thinking and that these immigrants who helped our US troops can NOT be dismissed because of some uninformed, misguided “campaign promise”. 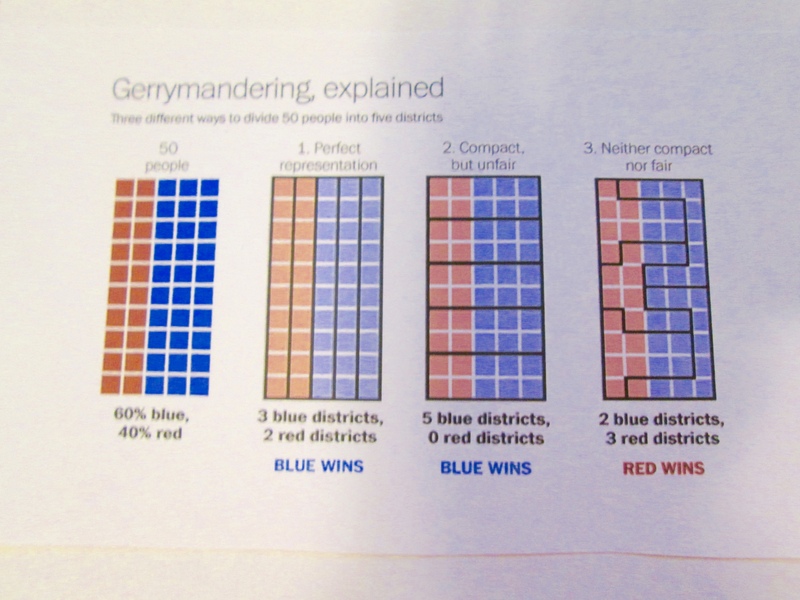 The above graphic that shows how you could divide 50 voters and how Gerrymandering works. The claims of so called voter fraud by President Trump that have not ever been actually proven in ANY STATE, have set off a flurry of activity in many conservative state houses to make it harder for legitimate older, poorer voters to meet the requirements, so that they may become disenfranchised from being able to vote at all. One state where I witnessed gerrymandering happening as a perfect example: the state of North Carolina. After the 2010 census, The Republicans in the state house in North Carolina ensured that Republicans took the state House, Senate, and Governorship in the year 2012 because they changed the boundaries in 2010 of the districts that normally voted for Democrats. (See the above graphic for how they did this.) This was ALSO done back in the times after the Civil War (after 1865). It was called: “Negative racial gerrymandering” which refers to a process in which district lines are drawn to prevent racial minorities from electing their preferred candidates or political parties. Thus, the Democrats lost because the people in those districts lost their Democratic representation in their own state and in the US House of Representatives. This is the REAL VOTER FRAUD. This is a map that shows how states in the USA redistrict after a census every 10 years. The state of North Carolina is one of the states where the state legislature does the redistricting. There are many other states that redistrict like North Carolina does. How many of those other states perpetrate voter fraud to get the party in that is the same as their own by gerrymandering when they redistrict, and in doing so screw over voters? Another piece of this unfair, fraud-ladened pie that I am updating this blog with has to do with the high number of polling places that were closed in southern and Republican leaning states which make it harder for poorer and older Americans to get to. This was published before the 2016 election. The mean-spirited, obvious disenfranchising many people to make it difficult for them to vote is appalling. Here is that story. Again how many people of color, older, and poorer Americans would these Voter ID laws affect whether many Americans can even vote or NOT? How many legitimate, legal Americans would be kept from voting because we make registration and voting so difficult? The irrational FEAR that a few people may be perpetrating fraud does not warrant these extreme measures. For this American, the fact that certain states want to make it harder for all legitimate voters to vote, is the REAL VOTER FRAUD FRAUD. When I was 18 years old, I spent nearly a week in Communist Russia when it was the Soviet Union. What a scary place for an American girl from California. That summer I learned gratitude that I was an American and had a Constitution to protect my rights. While in the Soviet Union, I experienced a few incidents, of weird intimidation by the Communist powers that be. I was young woman on a tour with about 40 other students from around the USA, and this was one of the few tour groups that traveled into the Soviet Union back then. First, we spent a few days in Moscow and then a few in Leningrad (now known as St. Petersburg). In Moscow the first night a police officer came by and asked me and three other tour members what we were doing- when were merely sitting on a park bench outside talking to each other on a summer evening. We told him “Nothing”. The tour members were from all over the USA. My roommate, M, for our stay in Moscow was from Alabama. I had never had friends from the South, so this was interesting to me to get to learn about people from different parts of the USA. The next evening, my roommate, M, and I visited another young woman, S, on the tour who was also from the South, from West Virginia. We just hung out in S’s room and talked for several hours. When we returned to our room, there was a passport photo of a mean looking Asian guy whom we had never seen before, with no passport and 100s of yen in a wallet. We did not know how it got in our locked room. That night we did NOT sleep well. The next morning, we asked our tour guide to help us complain with the Inter-tourist agency that was located inside our hotel. The only thing they said to us was that the man who left the wallet and photos probably thought we looked cute. That did not calm my anxiety much. All I could figure out was that this was some kind of intimidation that was going on to keep all of us Americans in check. We were told by our American tour leaders to NOT sell our jeans, books, music, or give anything to Russian people because before we left Russia the police might stop us. That had happened to other American students with this same American tour group during previous years. We also knew we could not speak up much in Russia, so most of us observed and talked amongst ourselves. One older student knew some Russian and would sometimes translate for us. Our tour guide was a lovely Russian woman who was strictly business. I remember once I tried to photograph her. I only got a photo of the back of her head. In Russia in the 1960s, we never saw children with their parents. When we visited all the sights, the children were always with their teachers or with the “Pioneers”, as they were called. The Communist state did a great job of indoctrinating children back then. I could feel the oppression of myself and the citizens of Moscow and St. Petersburg. 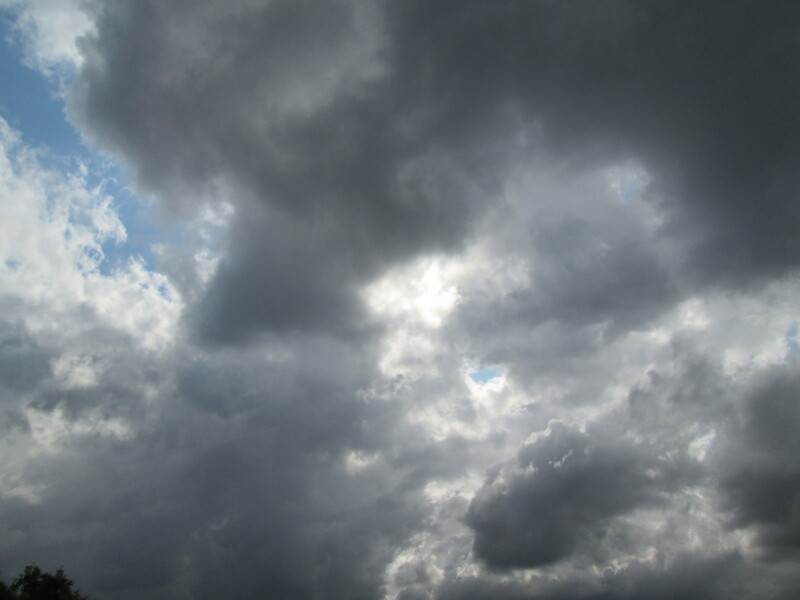 It felt like a heavy winter coat on a hot, humid, sunny day. And, of course, freedom of speech and press were nonexistent. One of the fathers and great leaders of the Communist party in the Soviet Union was Joseph Stalin, who made sure that freedom of speech and press did NOT exist and controlled the press absolutely. Having had this experience before I went off to college framed my life in a picture of political activism. 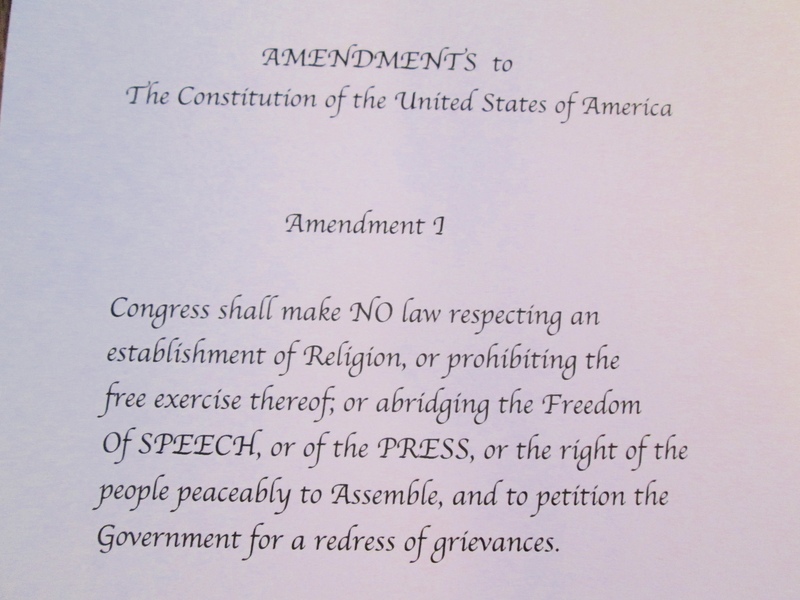 The Soviet Union in the mid 1960s showed me the importance of the USA’s first Ten Amendments to the Constitution- “The Bill of Rights”, of which Freedom of Speech and Press is the FIRST one. In a Tweet on February 17 our new president heaped even more than just insults on our still FREE PRESS. This is the story about that event. This statement by a US president is unprecedented in our history. This is a very ominous turn of events and reminds me of my short visit in Communist Russia, where the press was NOT FREE and controlled by the Communist leaders who followed Stalin. This is still true today in Russia under Putin. The press is no longer free as it was under former President Yeltsin in Russia. This is also true that the press is NOT free in most countries where they have autocratic leaders across the globe. Former President George W. Bush, a Republican, on February 27 this year went on NBC “TODAY Show” and defended our FREE PRESS in the USA. I feel deeply grateful to President George W. Bush that he stood up and spoke up for, not only himself, but for other Americans like myself who consider the First Amendment and our Free Press essential cornerstones of our freedom. We but mirror the world. All the tendencies in the outer world are to be found in the world of our body. If we could change ourselves, the tendencies in the world would also change. Two weeks ago I had an opportunity to meet and listen to the grandson of one of the people who has lived and made a huge difference in our world, M.K. Gandhi. Arun Gandhi was speaking in the town where I live. His message confirmed so much of what I believe: that we humans are one human family, personal peace and serenity come from how I choose to live and be responsible for my own life, the power of love for all people is essential for all people on this planet, how I can work with others, how greed and addiction to material stuff is diminishing the character and behavior of many of people, particularly our leaders on this planet. I was so thankful to Arun Gandhi that he visited our town, and I felt honored to be able to say to him face-to-face how much his grandpa was a hero of mine. The words and writings of M. K. Gandhi, helped change the course of my life when I was in my thirties. I had been through a major life change and had bought and then read Gandhi’s autobiography. That book and and movie, Gandhi, showed me a very different way to see the world. I started working with a peace organization and felt at home. That organization, Beyond War, also spoke about how all humans are one. My daughter also participated in activities connected to Beyond War. This echoed Gandhi’s message of how ALL of us are one human family. This way of seeing the world went into my heart. This thinking probably also planted the seed in me to become an English-as-a-Second Language teacher. Again while I was teaching to people from around the world, I got that although we are different, we humans are all linked together in one human family. In my late forties, I bought Dr. Martin Luther King Jr.’s writings and tapes of his speeches. King’s universal loving message again echoed what Gandhi had said during his lifetime. I discovered Dr. King long after he had died. These two leaders were my role models and have helped me to become who I am today and have influenced what I think and feel about much of what I see in the world. I am deeply grateful to both M.K Gandhi and Dr. Martin Luther King Jr for showing me a more loving way to be in the world. Unlike the fake heroes of movies, these were real men with their own human foibles. Their great thinking and way of being in the world outweighed whatever imperfections they may have had. That I came to know of them will be one of my life’s saving graces. Therefore, meeting M.K. 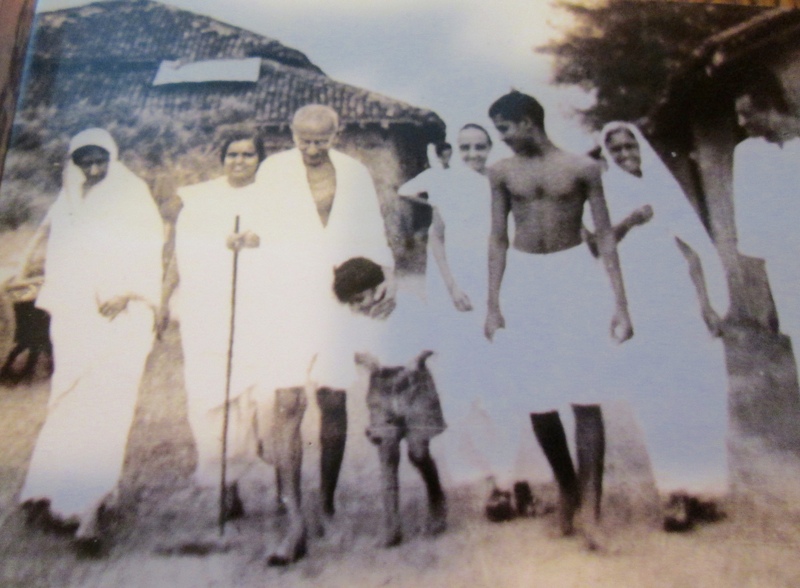 Gandhi’s grandson was like fulfilling a life dream. Arun Gandhi lived with his grandfather for more than one year when he was 12-years old. He is carrying his grandfather’s message out into the world. The photo I used in this blog is from the cover of his book, Legacy of Love. At this time, Gandhi’s message of love, tolerance, oneness of humanity is needed in many countries, including the USA and even in India. Fear, division, and greed between people has been adopted in so many governments and businesses across the world, and what is needed is open-hearted and kind behavior. I am going to stand on the side of love and kindness. It was a huge gift that I got to be reminded of this message by Arun Gandhi. This is a youtube video of Arun Gandhi speaking in Cleveland, OH from 2015. The introduction lasts for about two minutes. I do not ever expect to become Mohandas K Gandhi or Dr. Martin Luther King Jr. I can strive to live the principles that they showed in action to the world, and be the best me I can be. At one time in my life, when I was in my twenties, I was an immigrant for almost 8 years in a European country. As an immigrant, usually you must learn a foreign language. When I was first learning the new language, I found I suffered from headaches. Another American friend who lived in the same country for a few years said she had had headaches, too. Even if you learn that language before you go to the country, it is challenging living in that language daily. When you learn a foreign language, you can usually understand more than you can speak, particularly if the language does not have consistent pronunciation (English does NOT have consistent pronunciation). For me, I felt more at home once I could speak their language more fluently than many people and the shop keepers could speak English back to me. I still had an accent, but at least I did not get pegged as being an American. (When I was living in this country, the USA was involved with the Viet Nam War. At that time, the Canadian tourists used to wear Canadian Flags on their backpacks, so that they would not be mistaken to be Americans). Another big challenge for an immigrant is to try to understand the culture you are living in. It is good to have some friends from that culture. I also had friends who were immigrants, mostly from the former Czechoslovakia. If you only have American friends, then you will never truly never get the feel for, nor the understanding about the people where you are living. It also takes a lot of observing people and when and how they do things. Every culture has slightly different ways of doing things, and even how they see time. The country where I was living, the people tended to be punctual. However, one challenge, I did not have in my twenties was that I did not work in this country; I was a student. When I lived there again for about 8 months in 2000, I did work, but I was still quite fluent in the language, and I taught English- as- a Foreign Language in an English Language School to people from that country. I already had some understanding of the culture, too. In neither case was I an economic immigrant (in other wards, I was not financially strapped or stressed), nor was I a refugee, fleeing for my life. I only have an inkling how immigrants who come to the USA feel. However, I DO understand that feeling of feeling like the “other”. I was living in a country where part of it was somewhat xenophobic and nationalistic. Also there was very little diversity in that country. However, I NEVER had to suffer from horrible stereotyping, nor racism, nor vilifying of my faith, nor outright hatred, nor great anxiety which I am sure many of our newer immigrants in the USA have experienced a lot lately, and particularly within the last week or two. It takes people who are courageous to leave their homeland and everything they know. Change is one of the hardest things for most humans to adjust to do. That is what is absolutely required of most immigrants. That is why I can NOT back the latest new rules and laws against immigrants. I have been relying on NPR.org to get some general understanding about what has been happening this week. A voice from one of members of the House of Representatives from Texas gave me a reality check about how some of these new rules and laws will be for states that are along our southern border. For those of us who LOVE immigrants, we can stand behind them and try to support them, in whatever way we can, at least by showing them that we care. I hope that there may be a series of new lawsuits to stop some of the mass deportations that may occur in the not too distant future. Many states and American businesses will be negatively and economically impacted by these new rules if many immigrants are deported. Breaking up immigrants, who have caused no harm in this country, from their families is out right cruel, heartless and inhumane, and completely against the history of this country. 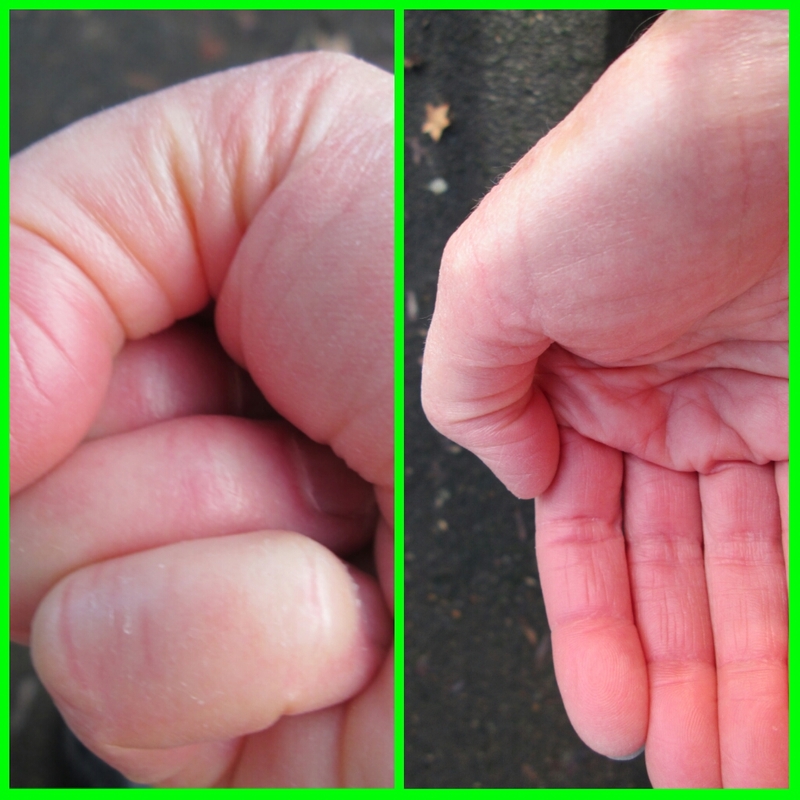 I am going to continue to extend an open hand to immigrants where I can. Thank God, I live in a state where most of the people feel the way I do. I no longer watch TV news, and I can barely listen to even NPR reports about refugees without shedding a tear or two. For 24 years as an English-as-a-Second Language (ESL) teacher, I taught people from other countries. Many of them were refugees. When I hear the stories about Somalis, I am deeply saddened. I am relieved that the US court system is fighting this ban of of the seven countries, including Somalia. About 17 years into my teaching career, I taught an elegant adult woman student who was from Somalia. She is a Muslim. She wore her head scarf to class, and she was hard working student. Unless you teach English, other than Chinese, English is one of the hardest languages to learn. It has the largest vocabulary, infinite rules, and pronunciation that is inconsistent. If you are a non-native speaker, it is a great challenge to learn. Heck, most of us Americans have our own difficulties with learning English well. Back to my student. She came consistently to class. Even though she was pregnant. She had a daughter who was elementary age. S always asked good questions, did her work, and was a kind presence in the class. She was the only African and Somali in this particular class. In the spring of the next year, I visited her when she had her son in the hospital. She was all smiles and very cheerful. Unfortunately, this was the last year I taught this group of students. There was a great deal of change (not for the good) in the ESL department where I was teaching. Therefore, I did not have the opportunity to see S for several years. I was very depressed after this job ended. Both emotionally and financially, I was hit hard. At least seven years later, I got a phone call from a woman with a lovely accent and a very soothing voice. It was S. I did reading and math tutoring, too, so she was calling me to help her daughter who was in Middle School, and her son who was seven by this time. I was so happy to see S again and tutor her children in one of the local libraries. Her son had become a good reader, and her daughter was a conscientious student, who needed help in math. S was still as elegant and kind as she ever had been. Then S also recommended me to tutor her neighbor’s son, too. Therefore, when I hear Somalis vilified because of some people’s irrational fears, I feel both angry and sad. Have the people who run scared ever met a person or a family from Somalia? The crack-down on immigrants this last weekend by ICE is more of the same vilifying of groups of people who are part of the fabric of this country. In the state of Washington, farmers are wondering who will pick their crops. This is true for many farmers across the USA. Do our grocery store shelves need to be empty of fruit and vegetables before people in Washington, D.C. wake up? Not to mention the businesses that motivated immigrants have started in this country, and the many other jobs where they have contributed so much to our economy in the USA. At one point our president’s family was from Germany. Not every immigrant today is selling drugs or a criminal. Aren’t all of us immigrants, except for the First Nations’ tribes? As a tribute and thank you to all immigrants, here is the entire song from “HAMILTON” called “Immigrants”. The only way I see to stop all this fear, is to cover it with love. Our immigration authorities vet the refugees who cross our borders well. For the few bad apples, our courts and immigration officials are very capable and will deport them. For me, I stopped being fearful of “the other” when I opened my heart and mind and listened to learn about to what and who I did not know well. I believe that is possible for most of us. 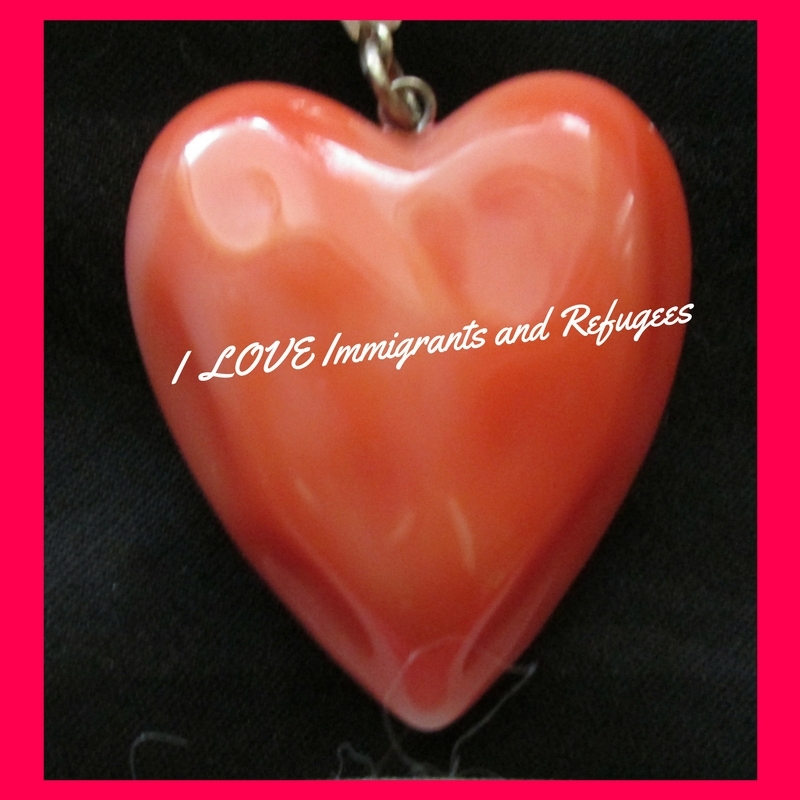 I am going to lead with my heart and keep on loving the new immigrants and refugees on every Valentine’s Day and every day. Last week about midweek, I was tormented during the night thinking I needed to fix the world and this country, in particular. I kept waking up feeling like I should do more to somehow prevent what was happening in this country I love. By the next day or two, I had the great opportunity to learn to have faith. I have always loved learning about history, and I learned to love history in high school from a great teacher, Mr. Garfield. Now I live in a town where many of the streets are named after the presidents of the USA. I always feel great when I drive passed "Madison" Ave. I love President Madison for what he did to fix our US Constitution- he added the "Bill of Rights" to our U.S. Constitution. If you don't remember it, that is what is protecting all of us Americans right now. So now, I have faith that the US Constitution is going to protect us. And it is because we have a government with three branches of government, including a judicial branch, which came through for refugees and people who were trying to return to the USA with valid green cards and found out that they were from the wrong country last week. Because I live in a country which tends to follow the law (although with certain groups, justice has not always worked well and still needs to improve), I can sigh relief and let go of worry. I can have faith that I live in a country where not just one person can be a dictator. I can have faith, too, that most people tend to try to do the right thing. This week I heard an old “Radio Lab” show called “The Good Show” about the goodness in most people. Try to listen to the entire show. I found this an uplifting show about the nature of most people. I needed the reminder. I also have faith because I have a source that I go to. For me, that source has many names: God, the universe, a higher power, the great mystery, the energy that connects all of us (even if we are not aware of it), the God particle. All those names are one thing to me. When I can humble myself and surrender that I do not have answers or control hardly anything, I give my concerns and go to my source. Then I am free and much happier. When I look back on my whole life, I have always been connected and protected by my source, even if I was not aware of that protection at that time. Now I can see the connection and protection that happened at the times when I was in challenging situations. It was when I did NOT have FAITH, I made choices for my life that were detrimental. Even in making those unhealthy choices, at the time, often something very good and wonderful came into my life. Even the unhealthy choices when I was willing and humble to LEARN about myself and my part helped me to reflect on what I did, so that I now live with more gratitude, joy, and happiness most of the time. Another lesson in faith came in late October of 2016, when my mother died. After she had passed, my siblings, daughter, and nieces and grand nieces found in her books as we sorted through them scriptures that my mother had read that most of us were not aware of. Even though my mother’s twin sister had died 13 years earlier in a different state than my mother, and my mother had not gone to her sister’s service because my father was wheelchair bound (they were both 85 years old), my mother requested that the same scriptures that her twin sister had had read at her memorial service be read at my own mother’s service. This, to me, is God at work. My own mother’s connection to this scripture and the beauty and comfort that this scripture provides has now been passed on to me. I am finally aware of this scripture, and read it when I need it and so does my daughter. Today, I read about some of my fellow Americans online. I am so proud of and have FAITH in you and us because so many people were calling the White House this week. We clogged the phone lines like never before. This is citizen activism at its best. Yeah! I have borrowed the title of this blog somewhat from talk show host, Tavis Smiley, who is on PBS. This is a youtube video of him explaining why he says “Keep the Faith” at the end of every show he makes. I love the explanation and find it relates to this blog. Thank You, Tavis Smiley.